Even though all content submitted has been carefully reviewed, no liability is assumed for the content of any external links, for which only the operators of the relevant websites are responsible. The protection of your personal data which we collect, process and use in the event of your visit on our homepage is of high concern to us. Your data are being protected within the framework of lawful regulations. Hereunder you will find information about which data are registered during your visit on our homepage and how same are being used. 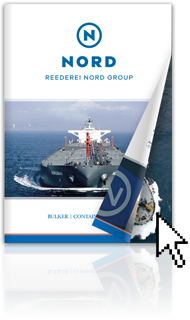 On visiting the website of REEDEREI NORD, for reasons of statistics we register your IP-address, time of visit, volume of data transfer, which pages were visited and from where and by which webbrowser (browser type, browser version, operating system) you accessed our website. Any personalization of your data does not occur. As far as this information enables relating to personal data we conform to the regulations of the laws of data protection. Any further personal data will only be registered when you provide such details on your own free will, e.g. when using our contact form for an enquiry. Whenever you have provided personal data these will only be used for answering your enquiries, for execution of contracts entered with us, and for technical administration. Your personal data will only be passed on to third parties or be otherwise transferred if this is necessary for execution of a contract - especially passing on of ordering data to suppliers - or else, if this is required for purposes of financial settlements or if we have your prior agreement. You are entitled to withdraw your consent effective for future cases at any time. Stored personal data will be purged once you withdraw your consent to such data storage or when holding such data is no longer necessary for the purpose of such storage or when their storage is inadmissible for other legal reasons. On written demand we will gladly inform you about the data stored in relation to your person.